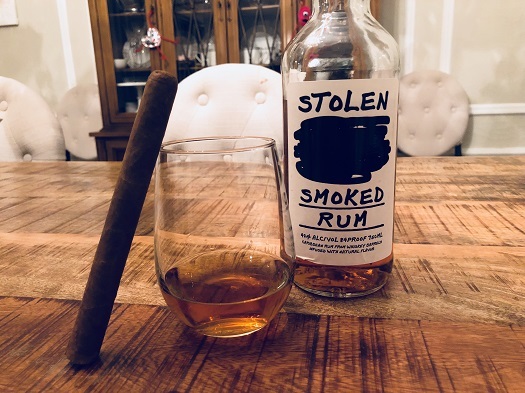 One of the more interesting, unique rums on the market is Smoked Rum from Stolen Spirits, “the world’s first smoked rum.” It is “the result of an artisanal approach fueled by the desire to reinvent the rum category.” It also doesn’t taste like any other rum you’ve had. The result is a deep copper-colored spirit with an attention-grabbing nose of charred firewood, molasses, barbecue sauce, milk chocolate, butterscotch, and candied pecans. Once sipped neat, a smoky mesquite flavor is instantly recognizable and pretty damn dominant. When they say “smoked,” they mean it; this rum has all the subtlety of a massive bonfire. Some of the background notes remind me of barbeque chips, caramel corn, coffee, vanilla, oak, and char. The finish is medium in length, warm, and sharply focused on the tip of the tongue. The most pronounced notes include cayenne heat, coffee, and molasses. I would agree with those who have claimed Stolen Smoked Rum tastes more like a smoky coffee liqueur than a rum. And in that regard it’s likely a divisive, love-it-or-hate-it spirit. For me, it’s more appetizing and better-balanced when mixed with Diet Coke—as opposed to enjoying it neat. Fortunately, the affordable price point doesn’t preclude mixing. Whatever the serving style, conventional wisdom would suggest pairing this spirit with a full-bodied smoke. But I’m going to suggest the opposite approach. In my experience, you’re better off going with a creamy, milder cigar to help offset the heavy-handed flavors of smoke, barbecue, and coffee. I had good experiences with Undercrown Shade, Pinar del Rio 1878 Cubano Especial Capa Natural, and Artisan’s Selection. I must say your final comment about pairing with a creamy-profiled cigar caught my interest even more than the spirit being reviewed. That’s because I have been on a quest of late to try creamy profiles. I must say though upon reading the reviews of the suggested cigars, none was particularly strong on the creamy aspect of the smoke. Do you have any other suggested smokes that might be heavy on the creaminess? It’s possible the three reviews I linked above (from 2015, 2011, and 2007, respectively) belie the amount of creaminess I find in those cigars. More likely, it’s possible my tastes–or the cigars themselves–have changed in the ensuing years. I don’t mean to punt your question, which is probably best answered in a post all its own, but if you search “cream” or “creamy” in the upper right search bar you’ll find all sorts of cigars worthy of exploration. Aside from mentioning the Sobremesa Cervantes Fino (which has an awesome creamy caramel note), this is probably the best I can do on short notice, especially since my memory is severely lacking. Thanks for the heads up on the search capabilities. And yes, I well recall the review of the Sobremesa Cervates Fino, which I commented on at the time that it was the second best cigar I had ever smoked. As for the possibility of an entire post on creaminess in cigars, that would be much appreciated!